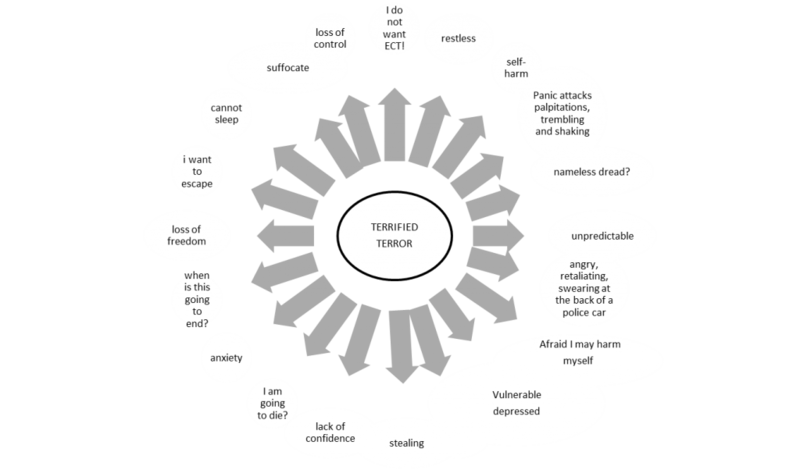 The spidergram below encapsulates beautifully the range of acutely unsettling thoughts and feelings I experienced during my journey into madness back in 2008-2010 and especially during my sectioning in an acute inpatient ward at North Manchester General Hospital in 2009. The spidergram is the result of creative writing and memory work that took place in the context of a creative project entitled ‘In My Shoes’ that was run by START in Manchester in 2010/2011. The artist facilitating the project helped producing the spidergram on a PC using my handwritten notes.